Click the image to download this great poster! 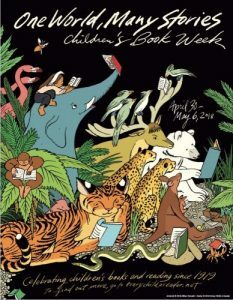 Children’s Book Week is an annual celebration of books for young people and the joy of reading.Established in 1919, Children’s Book Week is the longest-running national literacy initiative in the country. Every year, events are held nationwide at schools, libraries, bookstores, homes — wherever young readers and books connect! Official poster, with activities, illustrated by award-winner Jillian Tamaki and inspired by the 2018 slogan, “One World, Many Stories.” Free posters will be available at all events! Exclusive new bookmarks by five prominent children’s book illustrators. An original (and free) Children’s Book Week Comic featuring short stories from some of the biggest children’s graphic novel creators.